- Fifty-six per cent now say they are $200 or less per month away from not being able to meet all of their bills or debt obligations each month. - Fifty-two per cent say they are concerned about their current level of debt (up 9 points since February). - Half say they regret the amount of debt they have (up 7 points since February). - Thirty-eight per cent are concerned a rise in interest rates could move them towards bankruptcy (up 7 points since February). As consumer household debt continues to soar, Canadians' concerns and regrets about debt are on the rise as well. The MNP Consumer Debt Sentiment Survey revealed that the number of Canadians who say they are concerned about their current debt situation is up almost 10 points since February 2016. At that time four in ten (43 per cent) Canadians said they were concerned, now over half (52 per cent) of Canadians feel that way. For many, this is prompting some soul-searching, with half also now indicating that they regret the amount of debt that they have taken on, a jump of 7 points in as many months. 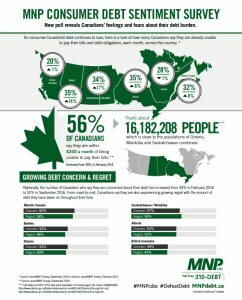 Grant Bazian, President at MNP Debt, has long expressed the need for Canadians to recognize the severity of their debt. He leads a national team of Licenced Insolvency Trustees in over 200 offices who have been working on the front lines of this issue across the country. "It's actually positive to see that a growing number of Canadians are concerned. Many households have come to rely on cheap credit in order to cover expenses but we can't continue to be comfortable taking on more credit to finance a lifestyle we can't afford," said Bazian. Fifty-six per cent of Canadians now say they are $200 or less per month away from not being able to meet all of their bills or debt obligations each month, including 31 per cent who say they already don't make enough money to cover them, technically making them financially insolvent. The proportion of Canadians who say they can't pay their bills is up 5 points since early 2016 and 10 points since February 2015. "With so many already feeling unable to cover their bills and debts, there is tremendous vulnerability to any kind of economic shock - the loss of a job, an emergency, a divorce, even things like a reduction in overtime pay or bonuses - and especially an increase in interest rates," said Bazian. The survey showed that concern about the potential for rising interest rates has also increased among Canadians. Thirty-eight per cent say they are concerned an increase in interest rates could move them towards bankruptcy, compared to only thirty-one per cent back in February 2016. Despite the anxiety around debt, over-spending remains a reality. Forty per cent of parents said they spent more than budgeted on back-to-school shopping for their kids, while one in three Canadians 'agree' they spent over budget on recreation or vacations during the summer. "The low interest rate environment has made it tempting to spend on credit without regard for household budgets. But interest rates will eventually rise. The fifty six per cent of Canadians already living so close to financial crisis should seek professional help now. One of the biggest mistakes people make is waiting until the point of devastation before getting help," said Bazian. Parents are more likely to be concerned about their debt situation than other Canadians: six in ten (60 per cent) parents are concerned with their level of debt. Debt concerns are also much stronger among middle-aged Canadians; six in ten (60 per cent) Gen X'ers are concerned about their debt situation, compared to 52 per cent of Millennials and 43 per cent of Baby Boomers. Concern about debt is strongest in the Atlantic provinces where 60 per cent worry about their current debt load, compared with 57 per cent of those in Saskatchewan and Manitoba, 53 per cent in Alberta, 52 per cent in Ontario, 52 per cent in Quebec, and 44 per cent in BC. Feelings of regret about debt are most present in Saskatchewan and Manitoba (59 per cent), followed closely by the Atlantic Provinces (58 per cent), Alberta (53 per cent), Ontario (50 per cent), Quebec (49 per cent) and BC (43 per cent). In Alberta there was an eighteen point increase in the number of residents who said they are $200 or less per month away from not being able to meet their bills each month. That represented the largest jump across the country followed closely by Saskatchewan and Manitoba (17 points). Residents of Ontario (35 per cent) and Alberta (35 per cent) are the most likely to describe themselves as financially insolvent, followed closely by Saskatchewan and Manitoba (34 per cent), the Atlantic provinces (32 per cent), Quebec (28 per cent) and BC (20 per cent). MNP LTD, a division of MNP LLP, is one of the largest personal insolvency practices in Canada. For more than 50 years, our experienced team of Licensed Insolvency Trustees and advisors have been working collaboratively with individuals to help them recover from times of financial distress and regain control of their finances. With more than 200 Canadian offices from coast-to-coast, MNP helps thousands of Canadians each year who are struggling with an overwhelming amount of debt. Visit www.MNPdebt.ca to learn more. Now in its second year, the MNP Consumer Debt Sentiment Survey is a semi-annual poll designed to track Canadians' feelings about their debt and their perception of their ability to meet their monthly payment obligations. The survey was conducted by Ipsos on behalf of MNP Debt between September 6 and September 12, 2016. For this survey, a sample of 1,502 Canadians from Ipsos' online panel was interviewed online. Weighting was then employed to balance demographics to ensure that the sample's composition reflects that of the adult population according to Census data and to provide results intended to approximate the sample universe. The precision of Ipsos online polls is measured using a credibility interval. In this case, the poll is accurate to within +/ - 2.9 percentage points, 19 times out of 20, had all Canadian adults been polled. The credibility interval will be wider among subsets of the population.